Experts at NASA’s Langley Research Center in Hampton, Va., and industry team researchers developed advanced noise reduction concepts. 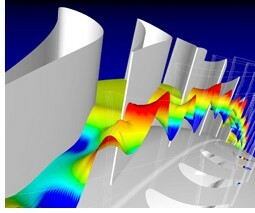 They used wind tunnels and computer simulations to initially test the concepts. With the initial conceptual testing completed, the team is assessing the ideas and actual hardware at a test flight facility in Glasgow, Mont. The researchers are using a large, specially equipped 777 passenger jet provided by Boeing. The test facility was outfitted with sophisticated microphone arrays and other measurement devices to record noise levels. The Quiet Technology Demonstrator 2 is a three-week test flight program to validate the ideas, including two improved chevron designs on the engine and a cover that fits on the landing gear. Chevrons are scalloped or serrated edges already used on some newer jet engines. One improved chevron design includes asymmetrical scallops around the engine. “The new design tailors the chevrons to take into account the air flow and acoustic differences that occur when the engine is installed on the aircraft,” said Charlotte Whitfield, NASA’s Quiet Aircraft Technology manager of airframe system noise reduction. Laboratory tests show the advanced chevron shape will reduce noise as much as four decibels during take-off and when flying at cruise altitude. Results of the flight tests may lead to changes in aircraft configurations, future airplane engine and landing gear designs. Goodrich Corporation’s Aerostructures Division, Chula Vista, Calif., and Goodrich Corporation’s Landing Gear Division, Cleveland, designed and built a toboggan-like shaped cover for the 777’s main landing gear. The cover streamlines the gear and makes it less noisy. NASA and Goodrich tested this concept in a wind tunnel on a 26 percent scale model of the 777 landing gear. NASA research indicated when landing, air rushing past conventional landing gear is almost as loud as engine noise. The covered gear concept could reduce landing noise by another three decibels. When testing is completed, Boeing will deliver the new technology equipped 777 to All Nippon Airways (ANA), in Tokyo. The aircraft will join the ANA passenger fleet and provide additional noise data based on regular operations. GE Transportation Aircraft Engines, Cincinnati also participated in the research. The goal of NASA’s Quiet Aircraft Technology project is to reduce perceived aircraft noise by 50 percent in 10 years and by 75 percent in 25 years, using 1997 levels as the baseline. The project is part of the Vehicle Systems Program in NASA’s Aeronautics Research Mission Directorate. The program’s goal is to demonstrate breakthrough aerospace technologies.